Well, I’m back in my Cardiff flat now after being home to see Mammo (my Nan) for her 85th Birthday. It was a great success! She had a lovely birthday with the family. Mum cooked spag boll for us all and Uncle Dave came over with Auntie Lynn and we all sat around the dinner table for the meal. Wine, Shloer and my own bottle of Crabbies (love Crabbies), with Ice cream for desert and birthday cake for afters – yum yum! Mammo was having her living room re-wallpapered and painted. Over the fireplace (that eternal fireplace with the cream marbled mantelpiece), the wall paper had been torn down to reveal about three or four other layers beneath, from times gone by, most of which, belonged to her when she first moved into the house in 1973. But the very bottom layer of paper, a deep pond blue with swirly golden, edwardian pattern had belonged to the people who had lived there before. A lot of history in that house. I tore a shred of the bottom layer from the wall and glued it into my Moleskine notebook – 9th volume. Then on the other side of the page I glued another shred of wallpaper, this time from the first layer up – Mammo’s first wallpaper, from her first year in the house. Wallpaper from 1973, hidden beneath layer upon layer of new patterns. I love my nan; she has so much history behind her. Why did I keep the wallpaper in my notebook? Sentimental reasons. A little piece of her I can keep with me. Mammo also showed me something she’d kept all these long long years. When I was young (not sure when, I must have been about six) I had my tonsils out in hospital because I kept getting tonsillitis really badly. But, when I was in hospital, I wrote Mammo a letter saying “Dear Mammo, hope you get well soon, and when I have my tonsils out, I will never have tonsillitis again”. The writing was so childlike in scribbling… I really can’t remember writing it ever. It’s part of that period of my life that is blurred and blanked. But Mammo kept that letter close to her, in it’s original little purple envelope. A real treasure. She had a very happy birthday. And I’m glad. And I hope you enjoy the show next month! 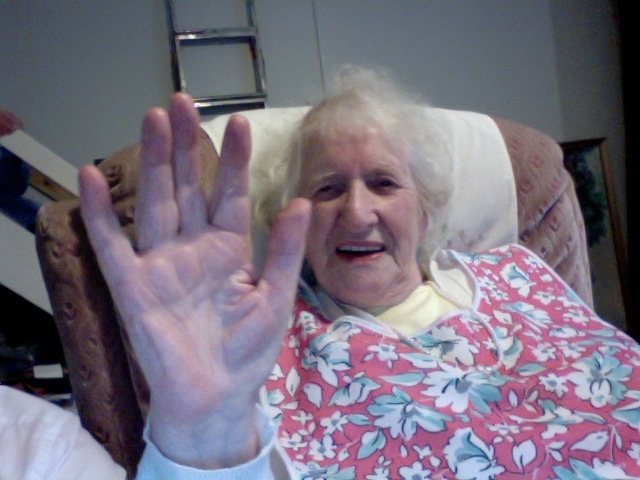 Mammo waves to the camera on her 85th Happy Birthday!